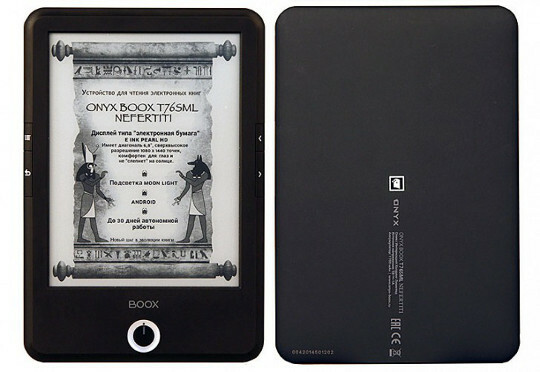 A new ebook reader from Onyx is now available on the Russian market, the Onyx Boox T76SML Nefertiti. The name may be a bit confusing (what does 76 have to do with anything) but the device has some interesting specs, no doubt. The T76SML Nefertiti appears to be a trimmed-down version of the newly-revealed Onyx Boox T68, which at least uses numbers that correspond to the screen size. Like the T68, the Onyx Boox T76SML Nefertiti has a 6.8-inch E Ink Pearl screen, with the same 1440 x 1080 resolution as the Kobo Aura HD. With 265 dpi, that’s the highest resolution screen commercially available from E Ink. Another similarity with the T68 is the fact that the T76SML Nefertiti runs Android, and a somewhat newer version at that. The specs say it runs Android 4.0.4, which is a lot better than the Nook’s Android 2.1. But I’m afraid that Android isn’t going to be as effective on this particular model because it lacks a touchscreen, and most apps require a touchscreen to function properly. In fact there’s no mention of the device coming with Google Play access in the press release, which makes sense because the device also lacks Wi-Fi. Another model that just launched in Russia, the i63ML Newton, does have Google Play access, although it runs an older version of Android, Android 2.3.1. Other features for the T76SML Nefertiti include a frontlight (they call it a Moon light), it has 1GHz processor, 512MB of RAM, 4GB of ROM, and a microSD card slot. It has a 1700 mAh lithium-ion battery with estimated discharge time of 1 month. The Onyx Boox T76SML Nefertiti comes in black color, and sells for a suggested retail price of 8990 rubles, which translates to about $260 US dollars.